Wellington authors Adrienne Jansen and Brannavan Gnanalingam visited Unity Books on Thursday 11th October to discuss Adrienne’s new novel A Change Of Key and Brannavan’s celebrated novel Sodden Downstream. Joining them was fellow writer Lynda Chanwai-Earle, who was enthused to talk about the themes of immigrant stories and multiculturalism addressed by both authors in their books. Brannavan spoke of growing up in an immigrant family in NZ and his experience with a lack of multicultural representation in the teaching of literature and writing within local academia. 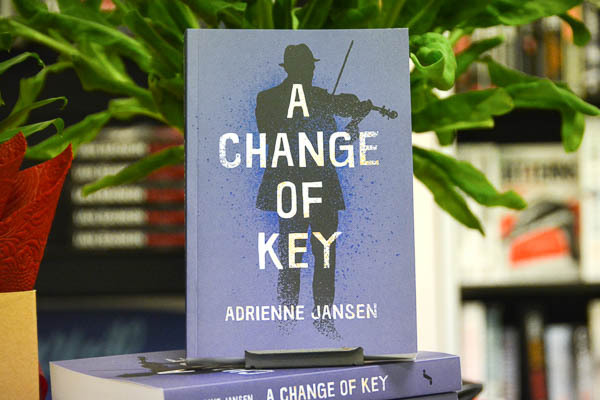 Adrienne agreed that her research for her new novel, A Change Of Key, which centers on a Bulgarian man attempting to forge a new life in NZ, chimed with Brannavan’s experience. Lynda closed the session by asking what the two authors have in store for the future. Adrienne is currently at work on two new collections of poetry including More Of Us, a follow up to her collaboration with Carina Gallegos, All Of Us. Brannavan teased that his next novel would be a book about toxic masculinity as it manifests in private boys schools. L-R; Brannavan Gnanaligam, Adrienne Jansen & Lynda Chanwai-Earle. Lynda Chanwai-Earle asking the questions. Adrienne and Brannavan both gave readings from their latest novels. Brannavan spoke candidly about his family’s immigrant experience. The three authors bonded further over a mutual appreciation of Wellington’s outer suburbs. Brannavan and Adrienne finished by joining in a call for broader racial representation in writing published and taught in NZ. We love the Unity lunchtime events crowds, always ready with a thoughtful line of questioning.